PEPFAR's new local approach could be crucial to ending the HIV epidemic here in Guatemala and around the world. Photo by Anna Watts for IntraHealth International. From food security to the future of PEPFAR, here are some of the trends we’ll be watching closely in the year ahead. Natural disasters, lingering wars, bourgeoning epidemics—2018’s headlines revealed a lot about the sheer volume of our human need. And in one way or another, each of those needs has an impact on our health and well-being. Here are just a few of the big global health issues that we at IntraHealth International will be watching and responding to in the coming year. Yemen’s health system has collapsed. There were some 40 attacks on health facilities and personnel there in 2018, the Safeguarding Health in Conflict Coalition reports, and half the country’s health facilities are no longer functional. As the emergency in Yemen continues into 2019, along with the lingering food insecurity in South Sudan, we’re also seeing more funders investing in food security and new progress by food scientists and researchers. The International Rice Research Institute, for example, is working to create drought- and flood-resistant varieties of rice with the help of a new perpetuity grant by the Crop Trust. And a plethora of new companies are racing to create commercially viable lab-grown meat, which could eliminate expense as well as the need to kill animals for meat production. Related: What Can We Do about Yemen? We’ve known for years that the increase in high-calorie, low-nutrient diets around the world is combining with our increasingly sedentary lifestyles to drive up global rates of hypertension, heart disease, diabetes, and other noncommunicable diseases, or NCDs. But the calories keep on coming. In fact, some corporate juggernauts are finding clever ways to market junk food as part of a healthy lifestyle—and having great success in populations as large as China’s. NCDs are now responsible for around 41 million deaths per year, according to the World Health Organization—and more than 85% of those occur in low- and middle-income countries. So why haven’t they made it to the top of most major funding organizations’ priority lists? Right now, NCDs get less than 1.3% of development assistance in global health budgets. But in 2019 and beyond, Devex predicts that more and more jobs in international development will focus on NCDs. Exercise in Dakar, Senegal. Photo by Nana Kofi Acquah courtesy of the Novartis Foundation. Health workers around the world face violence every day, whether they’re working in conflict areas, treating victims of violence, or fielding an influx of those fleeing violence in a neighboring country. And the ripple effects can be devastating. In 2018, we saw how war in Democratic Republic of Congo, for example, is ravaging fighters and villagers alike, but also providing a deadly foothold for Ebola. Now neighboring countries such as Rwanda are bracing themselves for potential outbreaks as people flee across borders. In 2019 we’ll continue to see the effects of this as health workers struggle to control the epidemic and administer the new life-saving Ebola vaccine. A sign warns of land mines on the road between Juba and Yei, South Sudan. Photo by Trevor Snapp for IntraHealth International. What’s going to happen with PEPFAR? For more than 15 years, the President’s Emergency Plan for AIDS Relief has been the US’s flagship HIV program. Now we’re starting to see the program change in big ways. Namely, it’s beginning to funnel a lot more money directly to local organizations that are based in the countries where the HIV work is happening—rather than to international or US-based ones. By the end of 2019, PEPFAR agencies should be directing 40% of their PEPFAR funding to “indigenous” organizations, says US global AIDS coordinator Deborah Birx. By the end of 2020, it’ll be 70%. That means the roles of international development organizations are changing, too. In the past, they’ve been in the driver’s seat, directly delivering health services, paying health workers’ salaries, choosing collaborators. These changes, though, will put more power into the hands of local change-makers, while NGOs continue to offer technical assistance and advice. This local approach will be crucial to ending the epidemic, which continues to kill a million people every year. 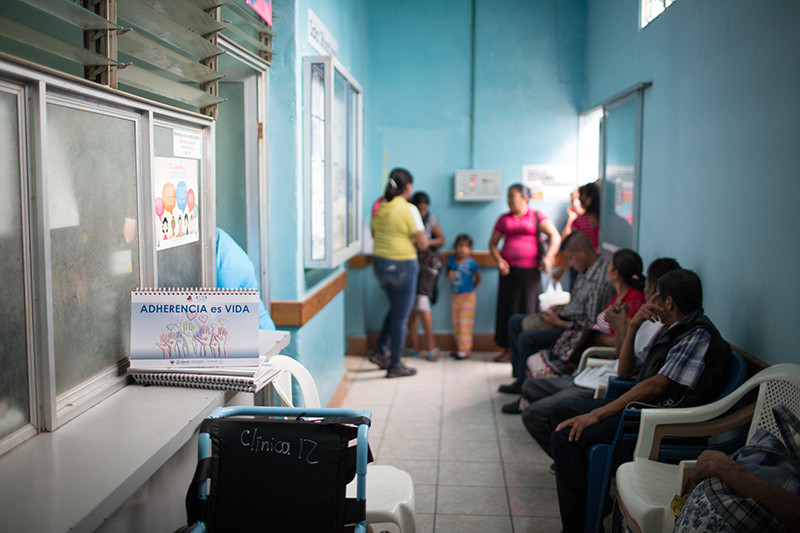 A health worker provides HIV counseling in Malacatán, Guatemala. Photo by Anna Watts for IntraHealth International. There’s no doubt that technology has changed the way health care happens—everywhere. “Even in rural Uganda, a patient can confirm her provider’s authenticity with a text message, and a community health worker can use Google to learn symptoms and treatments,” says Wayan Vota, IntraHealth’s director of digital health. Now artificial intelligence (AI) and machine learning are changing the way we manage our health in and outside the clinic. We’re starting to see more instances where health workers and researchers can use AI to diagnose eye disease, depression, Alzheimer’s disease, and more. And then there’s the DIY health tech. Want someone to talk to? There’s a chatbot therapist app for that. Want to have AI on your computer analyze your keystrokes and predict whether you’re developing a neurodegenerative disorder? You can sign up for that here. Want to track and record your every move to stay fit? Keep reading. All these new tools and applications are changing the way we take care of ourselves. They’re also generating scads of health data, which present their own challenges. What do we do with all these data? By the end of 2017, some 40% of American adults had used a fitness tracker. Now the market is growing around the world, including in Africa. The gadgets are flashy and fun—they can measure every calorie and nutrient we eat, every step we take, every blissful moment of sleep. And the stories around them are amazing—the girl whose Apple Watch uncovered a major kidney problem, the murderer unmasked by Fitbit data. But how do we systematically use all the data we’ve amassed through our myriad gadgets, apps, and databases to improve human health on a wider scale? Health workers are inundated with more information than the sector can process (and they’re not alone—most of us are dealing with some version of “InfoObesity”). In the years ahead, we’ll have to learn how to parse the important stuff. Twenty-eighteen was the year we had hoped might see a new contraceptive microchip on the market. Users could turn the tiny implant on and off via remote control, researchers said—making birth control easier to use and more futuristic than ever. We don’t have the microchip yet. But we’re seeing more countries adopt contraceptive technology that’s easier for health workers—and even clients themselves—to administer and use. Senegal, for instance, began seeing fantastic results after its clinics introduced Sayana Press. And a new contraceptive gel for men moved into Phase B trials just last month. While the news in November that we probably won’t meet our FP2020 goals was disappointing, many countries—such as those in the Ouagadougou Partnership in francophone West Africa—are making even greater investments in contractive technology and high-quality services to meet their populations’ needs. A pharmacy worker restocks Sayana Press in Senegal. Photo by Clement Tardif for IntraHealth International. They’re not kidding. Antibiotic-resistant gonorrhea is real and it’s a major public health concern. Scientists have managed to stay one step ahead of gonorrhea, but just barely. “Medication to treat gonorrhea has been around for decades,” a CDC video says, “but the bacteria has grown resistant to nearly every drug ever used to treat it.” Only one drug still works against it—a class of antibiotics called cephalosporins. But CDC is seeing resistance to these in several countries. Then—in case you’d like something else to worry about—there’s Mycoplasma genitalium, which UK physicians are warning could become the next superbug. Its symptoms (if they show up at all) are like those of chlamydia—only the antibiotics health workers use most often to treat chlamydia don’t work well on M. genitalium. And using them in misdiagnosed cases is promoting more antibiotic resistance. Health workers have a hard-enough time combatting STIs in their communities, thanks in part to the stigma and misinformation that surround these diseases. Drug resistance is an unwelcome complication. Nurses and midwives, most of whom are women, make up nearly half of the global health workforce. They’re critical to good health care around the world and a driving force behind improving gender equality and strengthening economies. In 2018, IntraHealth teamed up with Nursing Now, a three-year global campaign run in collaboration with the International Council of Nurses and the World Health Organization to raise the status and profile of nursing. Nurses have the power to expand primary health care around the world—but they need decent pay, workplace equity, and the opportunity to lead. In 2019, IntraHealth and our partners at Johnson & Johnson and the Nursing Now Campaign will release a gender assessment of nursing leadership. Are you a nurse or know someone who is? Get involved by filling out this survey. Related: Can the Astana Declaration Be a Turning Point to Finally Ensuring Primary Health Care for All? Twenty-eighteen brought us earthquakes and tsunamis in Indonesia, hurricanes in North Carolina, and fires in California and Portugal. As more extreme weather events take place and we see more of the effects of climate change around the world, health workers will be on the front lines in more ways than one. As we move into 2019 and beyond, this is one global health issue that will affect us all.